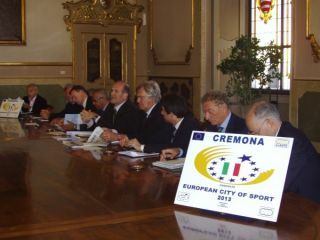 This was the title of the cultural contribution that Sportmeet offered in Cremona, candidate for the status of european city of sport 2013, at the conference “Sport which qualifies the territory and promotes economy” held on Saturday October 15 at the Chamber of Commerce in Milan. Besides the speech “The contribution of sport in social policies of public administration” delivered by Roberto Pella, manager of the policies for youth and sports manager of ANCI (national association of Italian municipalities), and the speech “Marketing at the service of the territory” delivered by Roberto Ghiretti, president of the same named sports marketing studio, Paolo Crepaz contributed with the experience and the cultural consideration of Sportmeet. His contribution highlighted how play, sport and physical activity can move people, inspire them to undertaking a personal path of grow, can let them meet and encourage new, positive relationships. It was also stressed how and on which conditions sport can let people grow as citizens and as athletes: the educative and social value of sport must be known, enhanced and exploited in an era, like that one that we are living, when urbanization is an unstoppable phenomenon. Today the 50 percent of mankind on earth lives in a city, but it is going to become the 70 percent in 40 years. In this stimulating but at the same time worryingly perspective, sport can have a significant role too, in order to develop or not the brotherhood among humans.